I was ashamed at how, despite its heroism and service in the war, Poland was abandoned by the West in the immediate post-war period. As an historian, I knew well the role of the famed Winged Cavalry in lifting the siege of Vienna and saving Europe from Turkish invasion in 1683. I was also keenly aware of Poland’s long struggle to maintain its independence and sovereignty in the center of a turbulent and often hostile Europe. As the grandson of Irish immigrants to Canada, I understood how difficult and long the struggle for independence can be. And finally, on a trip to Poland during the seventieth anniversary of the start of the Second World War, I witnessed an incredible sight: an entire nation united in its determination to protect its independence and freedom. Unlike much of the west, Poland does not take its freedom for granted. It values its participation in NATO where it again stands shoulder-to-shoulder with Canada. More recently we have seen Poland adopt courageous but difficult decisions within the EU to protect its culture and national cohesiveness. These are not easy positions to adopt and hold within the EU. Is it possible Poland once again stands protecting Europe? From the time of my moving visit to Mont Ormel, I have looked for an opportunity to honour Poland’s role in defense of the west and celebrate its unique ties to Canada. I hope now that opportunity has arrived. Project “General Maczek” is a privately-funded effort aimed at honouring the past and present alliance between Canada and Poland in World War II and today in NATO. This effort has been funded and supported by private individuals, army veterans, and Polish community organisations and churches across Canada. The goal is to lay two wreaths at the Cenotaph of the First Polish Armoured Division in Warsaw. The first will honour the men and women of Poland who played such a vital role in securing victory in World War II on land, sea and in the air. The second wreath will specifically honour the courageous role of the First Polish Armoured Division which served as the Winged Cavalry of the First Canadian Army in Normandy and through Northwest Europe. The goal is to enhance and strengthen Canadian-Polish relations by highlighting the bond, sealed in blood, between our two nations. The project has been approved by Polish officials. The ceremony will take place in Warsaw on the 3rd and 4th of October this year, and it will be held under the patronage of the Institute of National Remembrance and its Chairman Dr. Jarosław Szarek. The organisers would like to thank St. Michael’s Polish Benefit Society from Sydney, Nova Scotia, and Mr. John Danch, Royal Canadian Legion and former President of Multicultural Association of Nova Scotia and Multicultural Council of Cape Breton for his support and endorsement of “Project Maczek”. Canada worked hard over the past decade to establish itself as an energy super-power and did so without much help from its neighbor and largest trading partner the United States. We shouldn’t take this personally as the present U.S. Administration has been equally hard on domestic producers of oil, gas (especially shale producers) and coal. The White House has certainly been consistent—alternative fuels are in and old fashioned hydrocarbons are out. Ironically it is the out of favor hydrocarbon sector that has been booming, thanks largely to private capital, private land, new technology and skilled blue collar labor. This combination has pushed the U.S. ahead of Saudi Arabia as the world’s largest exporter of oil and gas and driven prices down precipitously. Will the Canadian economy crash along with the price of crude? No. Unlike Russia or Venezuela, whose economies have been described as large national fueling stations. Canada is a highly developed G7 economy with many vibrant economic sectors beyond energy. With falling energy prices and a falling dollar, investment money, resources and people will shift cross sectors and regions. Some of these adjustments may be painful but when the smoke clears, our economy will emerge more efficient and competitive. Forget the short term microeconomic stories in the news, especially those sensationalized. If I hear one more person preaching on a street corner, a blog or an airport lounge that Target’s closing is a “sign,” I’m going to scream. What nonsense. Target died of hubris, combined with poor decisions—a whole lot of them—piled one upon the other. This story will have to wait for another day. Canada’s economy is overly weighted toward commodities. When commodity prices are strong so is our dollar but the reverse is equally true. The rise and fall of commodity prices is driven primarily by global growth. When the world is growing, the demand for Canadian commodities is strong, prices rise, along with our dollar. And it is risky to prognosticate future commodity prices based on the present situation. It wouldn’t take much incremental growth in China, India and South Asia to tighten demand for oil, gas and other commodities. We have lived through these cycles before. Remember such titles as “A World without Oil” followed by “Peak Oil.” One predicted free oil, the other no oil. Take your pick but remember both were wrong. Whatever energy costs are, Canada is well positioned to adapt and grow. It isn’t an accident that Canada emerged from the great recession of 2007-2009 faster than any other country in the OECD (Organization for Economic Cooperation and Development). Canada went into the crisis in better shape than most, especially on the fiscal side. After nearly going broke following decades of deficit spending, Canada hit a fiscal wall in the mid 1990’s when its bond ratings were lowered and the carrying cost of our enormous public debt skyrocketed. The fix required spending cuts so painful, the memory still linger in the public psyche. This has made the country suspicious of open-ended deficits. Canadian have shown themselves willing to pay for social services with higher taxes where the need is proven but running up an open tab for our children to pay is looked upon suspiciously in many parts of the country. Over the past two decades Canada has not just been focusing on energy. Trade has emerged as an ever more important part of Canada’s strategy for the future. Free Trade Agreements within North America, Europe and, down the road, with Asia and South America signal a commitment to expanded trade. A lower Canadian Dollar may make your trip to Disney a touch more expensive but the impact going the other way is profound. American visitors will find Banff, Toronto, Old Montreal, the great fortress at Louisbourg, all considerably more affordable. Exports of every kind will become more competitive. Think of the impact of a 15%-20% reduction on the price of a Dash 8 or a Bombardier C-Series aircraft, or a crate of Main-a-Dieu lobster? These adjustments will take time to work through the economy but their impact will become ever more powerful. Canada is more than a one trick pony. Canadian economist John Kenneth Galbraith, was at the center of many of the most important economic developments of the last century. He worked for several American administrations from Roosevelt through Kennedy. Toward the end of his career he made a number of interesting observations about economics and history. My favorite was this: never to underestimate stupidity as a causal factor in failure. Galbraith himself was not above error but his stayed with me over the course of 30 years of management consulting, business writing and investment failure analysis. Large organizations, run by well-educated and well paid people do make mistakes, big ones and the worst of these support Galbraith’s hypothesis. What is maddening is how the people who make bad decisions rarely pay for them. Oh yes they sometimes lose their job, golden parachute and all, but it is front line employees who really pay the price. Nowhere can a better example of Galbraith’s theorem be found than in the recent collapse of Target in Canada. Stupidity may be too strong a word to describe Target’s demise but hubris certainly is not. Target had so much going for it entering the Canadian market that no one could conceive of failure. That alone should have set off alarm bells. It had tremendous brand power behind it. It took decades and billions of dollars to develop Target into an American mega-brand; by 2012 taking it across the border into Canada looked like a no-brainer. Canadians were already familiar with the product; those living along the border were accustomed to weekend shopping excursions which often included a stop at Target. As so often happens past success can pave the way for future errors. It was assumed for example that Target understood Canadian buyers based on the numbers already coming across the border to shop. Many Canadians did indeed like the overall “American” Target package rooted in quality, value pricing, lots and lots of variety, plenty of stock, friendly, wide open aisles and good customer service. And that offering might well have worked in Canada but it was never tried. What evolved in Canada was a hodgepodge of mixed quality, poor selection, inadequate stock, high prices (higher at least than the consumer expected), indifferent or unprepared customer service and cramped aisles. This “Canadian” Target offering was not the result of a preplanned strategy based on understanding the market; it was rather a happenstance bundle that evolved incrementally and internally, largely disconnected from the market and the consumer. Canada may be a tough market for big box stores but Wal-Mart and Costco are thriving. Rather than resisting Target me and my neighbors were looking forward to Target’s entry into Canada and especially here in Sydney which suffers from under-competition in a range of sectors. Many of us couldn’t wait for Target to open. When the doors finally opened, after a good many delays, the disenchantment soon set in. My initiation began with a foray aimed at buying a goose down pillow. The parking lot was jammed and the weather awful but I persevered only to find an enormous, largely empty pillow rack. I enquired and was told “maybe next week.” The store seemed chronically starved of inventory in category after category. The next big mistake and this may well have been the fatal one, involved speed and mass—which in any project are risk generators. The rule of thumb is simple: slow and small is less risky than fast and big. Rather than starting small, learning and then expanding, Target launched Canada-wide and at a suicidality fast rate. This allowed little time to learn from errors, never mind correct them. It was all too big and moving too quickly to allow for learning, correction and recovery. Buying Zeller’s coast to coast leases in 2011 may have represented a bargain for Target but trying to transform all of these locations to Target stores in a compressed period of time proved fatal. The hundreds of millions of dollars in shut-down costs will likely prove small in comparison to the longer term damage to the brand. As for the hard working employees who got caught in the whip-lash; they didn’t create the problem but they sure are paying for it. We can only hope most land on their feet. A very rare photograph of the original Avro Arrow CF 105, number 201, hangs on the wall of the community center at St Mary’s Polish Church on Whitney Pier. The Arrow, designed and built in Canada, was the fastest, most sophisticated jet interceptor in the world in the late 1950’s and its cancellation was a tragedy for Canada’s aerospace industry. The photograph of the Avro Arrow is signed by Jan Zurakowski, the test pilot who flew this mighty aircraft. 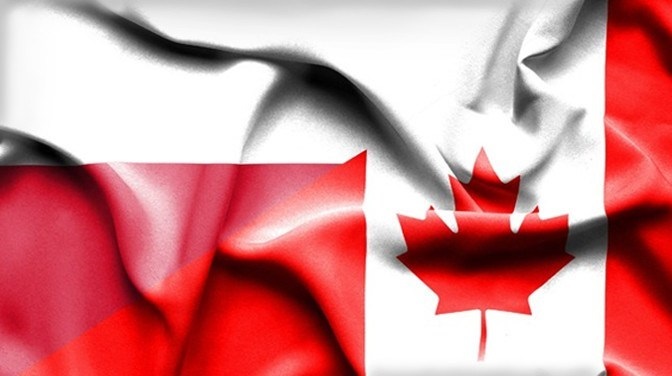 The contributions of Jan Zurakowski and Spud Potoki to Canada and the free world, both during and after the war, reminds us of the immense sacrifice made by the Polish people during that titanic struggle. Few understand Poland’s immense contribution to the war effort and the close ties with Canada. It is an incredible story. 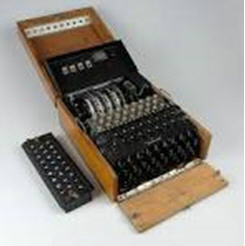 After the fall of Warsaw, Polish intelligence operatives delivered to France and Britain a reversed engineered German “Enigma” cipher machine. Polish mathematicians and crypto-analysts like Marian Rejewski, Jerzy Rozycki and Henrskyk Zygalski cracked early versions of the Enigma code and had been intercepting and decoding German radio traffic starting in the mid-1930’s. This Polish breakthrough aided immensely in the work of code breakers at Bletchley Park in Britain where decoded traffic was classified above “Top Secret” with the designation “Ultra.” The breaking of the Enigma code was critical to the Allied victory. Polish forces provided crucial help to Canada and the Allies throughout the war. Fighting alongside the Canadians, the Poles participated in the evacuation of Narvik, the capture of Tobruk, and the bloody assault against Monte Cassino. The Polish Army came ashore with the Canadians on Juno Beach to close the Falaise Gap, ending the Battle of Normandy. The Polish Armored Division remained part of the First Canadian Army advance into Germany and the Low Countries. The next time you walk by beautiful St Mary’s Church, drop in and say a prayer for all our servicemen and women, past and present. Then take a moment to view the stunning Avro Arrow photograph signed by Jan Zurakowski and reflect on how Poland and Canada have stood shoulder-to-shoulder…then and now. By this point in the war both sides had come to truly hate one another. We know Wheeler’s cavalry made short work of “bummers” unlucky enough to fall into their hands. One of the quotes I use in Immortal City on the capture of Sherman’s foragers is chilling, “We scattered their brains and moved on…” Orders issued from Sherman’s headquarters as the March to the Sea progressed show an increasing desire to rein-in foragers, especially “unauthorized” ones. One can sense that a fringe element of Sherman’s army had slipped the leash and were conducting their own war. There is no doubt Sherman's tactics of making war on civilians was a radical break with the past. However, the propensity to be ever more brutal as the war progressed can be seen in the campaigns in Tennessee and north Georgia leading up to the burning of Atlanta and the March to the Sea. If you study his letters and writings you will see that Sherman's own assessment of what was right and wrong changed and evolved. Somewhere between 1863 and 1864 Sherman's views hardened. Sherman’s letters reflect his change in attitude as it became apparent the South was not going to come back willingly into the Union and appeared ready to fight it out to the end. I cannot but suspect some of this “hard hand of war” thinking was emanating from Washington and perhaps even the White House. By this point in the war Stanton had purged the army of any leaders associated with McLellan and his conventional and more moderate views on making war. In the summer of 1864 the North was a long way from winning the conflict and Lincoln faced imminent defeat at the polls if nothing changed. If Sherman had not captured Atlanta in early September, Lincoln would almost certainly have been defeated in November; Lincoln himself forecast such a defeat. So despite all the talk of Grant saving the union, it was really Sherman’s capture of Atlanta that ensured Lincoln’s reelection and, in turn, doomed the South. An interesting comparison can be made here with General G. McClellan. “Little Mac” had his deficiencies as a fighter but he was a brilliant organizer. It was he who rebuilt and professionalized the shattered Army of the Potomac after the disaster of 1st Manassas. McClellan held some strong views on the conduct of war and these were conservative and conventional. He opposed scorched earth tactic as morally wrong and wrong-headed. In his view scorched earth tactics would engender such hatred as to make it harder to bring the South back into the Union. In McLellan’s view Southerners were still American’s even if they had erred in seceding from the Union. These conventional views were shared by General Lee as evidenced by his strict no looting or entering private homes field order issued before the invasion of Pennsylvania; an order that was fairly well adhered to by the rank and file of the Army of Northern Virginia. And while McClellan was accused of being conventional and a better organizer than fighter, no one ever accused Bobby Lee of avoiding a fight. McClellan could see that Washington and, in particular, the Republican Party were exercising greater and greater influence on military matters and he feared politicization of the war. He did not favor an all-out war of conquest and confiscation as proposed by the Republican Radicals. In the end however this is more or less what the Civil War became; the South was ground down one army, one brigade and one regiment at a time, until defeat was inevitable, with the South exhausted and in ruins. Who was right? Well the winners generally write the histories of conflicts and thus criticism of Sherman in Georgia and South Carolina has been muted since 1865; everywhere that is except in Georgia and South Carolina. A sixty mile swath of destruction followed Sherman’s March to the Sea. It took well into the 20th century for this part of central Georgia to recover. In South Carolina the destruction was worse. Just cross the river at Sister’s Ferry and you will come across ghost villages that were burned out and never came back. I would like to propose a hypothesis regarding the March to the Sea for consideration. What if Sherman’s troops had “foraged liberally” as ordered taking whatever they needed, destroying military and rail lines etc. without resorting to destruction of private property? Wheeler’s own cavalrymen were themselves taking what they needed and were considered by some Georgian’s as bad a Sherman’s “bummers.” General Sherman would have captured Savannah exactly as he did because General Hardee had firm orders to sacrifice Savannah and save his army. Hardee would have retreated into SC across the pontoon bridge the minute it was finished, just as he did. Sherman would have invaded South Carolina and captured Columbia, which would probably have been burned since this was an example of out of control troops rather than something ordered by Sherman. (This lack of discipline was the real threat to Savannah rather than anything Sherman might have ordered or not ordered.) Besieged by land and sea Charleston would have fallen as it did and the Battle of Bentonville NC played out pretty much as history records. The truth is that with the fall of Savannah the final act in this great American tragedy was underway. Grant, after taking appalling casualties, would still have outflanked Petersburg and Richmond would have been abandoned exactly as happened, setting the stage for Appomattox and the end of the war. So what good did the “hard hand of war” tactics achieve? It certainly terrified the civilian population but they were plenty frightened already by Sherman’s army after the burning of Atlanta. Did it increase Confederate desertions? Perhaps but only on the margin, and no more than the exhaustion of three and half years of slaughter would have wrought. None of this would have changed Lee’s strategy for the defense of Richmond which was to protect the rail lines south. Once these were cut the city had to be abandoned. The journey to Appomattox had begun. What might be different today is the focus on the March to the Sea. Although he faced little opposition, Sherman’s move east was courageous and brilliant. It certainly helped shorten the war. Sherman showed great generosity toward General Johnson and his defeated army after Bentonville; so generous as to draw the censure of Washington. But all this is forever clouded in the debate about the question of making war on civilians. This is a different perspective perhaps but food for thought on a winter’s night. McClellan's War: The Failure of Moderation in the Struggle for the Union, E.S. Rafuse. Walking Away from Nuremberg: Just War and the Doctrine of Command Responsibility, Lawrence Rockwood. I. For the purpose of military operations, this army is divided into two wings viz. : The right wing, Major-General O. O. Howard commanding, composed of the Fifteenth and Seventeenth Corps; the left wing, Major-General H. W. Slocum commanding, composed of the Fourteenth and Twentieth Corps. II. The habitual order of march will be, wherever practicable, by four roads, as nearly parallel as possible, and converging at points hereafter to be indicated in orders. The cavalry, Brigadier - General Kilpatrick commanding, will receive special orders from the commander-in-chief. Barry Sheehy has an odd habit; he purchases land, protects it and gives it away. Sheehy, who moved to these parts from Montreal around 17 years ago, lived for a while on an island near Savannah, but several stormy seasons convinced him it might be advisable to move to higher ground. 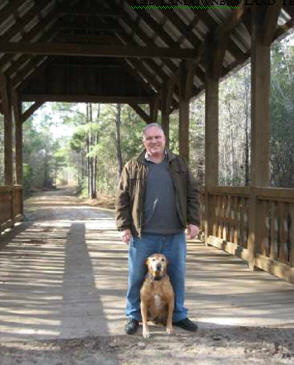 He purchased land in Effingham County in 2003. “My wife, Chris, loves to ride horses, so we wanted to hav e land where we could be close to them. Chris loves them; I clean the tack,” Sheehy says, although he does confess to enjoy riding on the property’s well-maintained trails, including one that carefully circumvents an Indian mound on the property. Period maps from around 1817 note the mound’s presence. The land features extensive bottomlands associated with Black Creek, a tributary of the Savannah River. The hardwoods and other vegetation along the creek are protected from any future logging. This benefits water quality in an area that provides water to nearby Savannah and is vital to drainage and flood control in the area. Sheehy has a great fascination with history, particularly of the American Civil War. He notes that during his 20 years serving in the Canadian Army, he developed a great interest in all history. Upon moving here, he discovered the powerful draw of the history of this area. Working with a loosely organized group of associates (they call themselves the Children’s Crusade, Sheehy noting that “we’re not young, but we’re foolish”). The author of several books, Sheehy will soon publish the first two of a four-part series on Savannah during the Civil War. The Sheehy ‘s first easement was recorded in 2004 and the second in 2006. The first property was then donated to Effingham Count y and discussions are under way with the Effingham Count y school board to donate the second property for use as an educational center. “I am extremely excited about the school board’s acquisition of this property,” says Randy Shearouse, superintendent of Effingham Count y schools. “As our county continues to grow, our students will have an outdoor refuge in which to engage in many worthwhile learning activities. Mr. Sheehy ‘s generous gift will keep on giving back to our students in Effingham County.” The facility, when up and running, will be called the Lisnacullen Conservation Center, named in honor of the Sheehy‘s farm. Dec. 9, 1864, must have been cold and desperate for Confederate Col. C.C. Jones and some 600 men as they fought to defend themselves against Union troops at Cuyler's Plantation and Monteith Swamp on the Effingham-Chatham county line. With a total of four guns to hold at bay Union Gen. William Sherman's 14th and 20th corps, which were approaching Savannah from Augusta and Monteith roads, Jones' orders were to slow Sherman's advance to keep open the vital railway bridge to Charleston for as long as possible. The bridge was the last line of communications and supply with the Confederate Army in South Carolina. Once the bridge fell into Union hands, Savannah was cut off and effectively under siege. Flanked by muddy swampland on both sides of the Middle-Ground Road and Augusta Road (near today's Rice Hope Plantation on Highway 21) and Monteith Road that crossed over a swamp bearing the same name (near today's Hodgeville Road and Highway 30) Jones set up blocking points behind well-prepared earthworks that would make outflanking difficult. The ground between the two positions was nearly impenetrable forest and swampland, crossed by a few small trails that were picketed by the calvary. 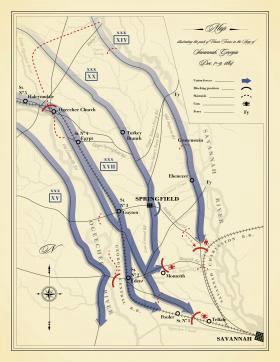 On the afternoon of Dec. 9, 1864, Jones and his men were attacked by Sherman's 20th Corps on Monteith Road, and the 14th Corps hit Jones' troops hard on Augusta Road. Jones' small band of men managed to hold off some 30,000 Union soldiers at Monteith until a late afternoon fight that resulted in about 20 casualties, including a number of dead on both sides. Jones' position at Cuyler's Plantation held until after dark. In the fighting at Cuyler's, an artillery duel between Confederate and Union guns resulted in the death of a young Union battery commander, Lt. Coe. Coe was buried near the battlefield, somewhere between Cuyler's Plantation and Mulberry Bluff Plantation, where his body was recovered by his family after the war and shipped home to his widowed bride in New York. On Saturday, the Historical Effingham Society will mark the battlesites of Monteith Swamp and Cuyler's Plantation. The marker is sponsored by Effingham County resident Barry Sheehy, an active life member of the Historical Effingham Society, and will be located about 1,200 yards from both battlesites. Sheehy chose the site of the marker because it is dead center of the defensive arc linking Monteith and Cuyler's Plantation. He covered the cost of the marker and wrote the historical supporting paper, "Forgotten Battles," which was published in the summer 2005 edition of Georgia Historical Quarterly. "This was really one engagement fought at two locations simultaneously, so a single marker is a good starting point," Sheehy said. In time, Sheehy said, he hopes additional markers can be placed at both the Monteith and Cuyler's Plantation battlesites, but, "it can take a long time and a lot of effort to acquire the necessary permission, donation of land and financial sponsorship for a historical marker." Sheehy said given the pace of development in Effingham County, it is vital that these historic sites be identified and, whenever possible, preserved. "Once they are paved over, they are gone forever," he said. Cuyler's Plantation is now long gone, subsumed by Rice Hope subdivision, and the site of Monteith Plantation and swamp is threatened by encroaching development. The field where Monteith Plantation once sat has been preserved by local land owner Gerry Dotson who, Sheehy said, "deserves a medal for resisting developers." To set the example, Sheehy has placed almost all of his 280 acres of land - including the site of the marker - into permanent conservation easement with the Georgia Land Trust. This means the land will remain undeveloped in perpetuity. Saturday's ceremony will begin at 2 p.m. at 450 Moss Loop in Rincon, followed by reception and refreshments at The Gunner's Mess, 420 Moss Loop. The Sons of Confederate Veterans also will have a Civil War encampment on display.